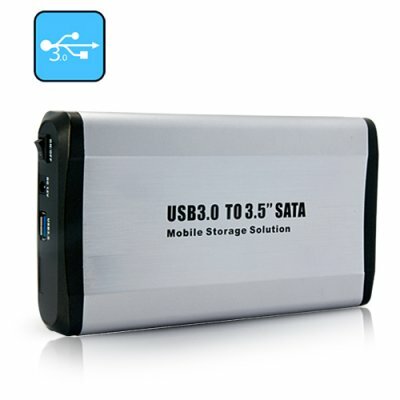 Successfully Added USB 3.0 to SATA HDD Enclosure to your Shopping Cart. The wait is over, literally. Introducing our first super-speed USB 3.0 SATA HDD enclosure. This USB 3.0 SATA drive enclosure lets you connect any 3.5 inch SATA HDD or SSD through USB 3.0. Supporting data transfer rates of up to 5 Gbps, this external HDD enclosure delivers access to files at lightning fast speeds - 10x that of USB 2.0, and 60% faster than SATA II eSATA. In addition, the USB 3.0 interface is backward compatible with USB 2.0 and 1.1, so the enclosure can be used with older systems that don't support the newest USB standard, at speeds of 480Mbps and 12 Mbps (respectively).